In New York, it looks like we are getting 3 nor'easter storms in as many weeks. This time of year, as I start to yearn for spring, and am teased with a few above average spring-like days, I must remind myself that we are still in "moody-March." Even though I am over winter, winter is not over us. Yesterday was our second nor'easter in March (the third is expected early next week). I was ready. The refrigerator was stocked with multiple meal options, there was plenty of sidewalk salt just outside the back door and the shovel was in position for immediate use. And, for this particular storm, I had stocked up on baking supplies. Because, when it's cold and the snow and sleet are braising the doors and windows, working around a toasty oven always warms the family. 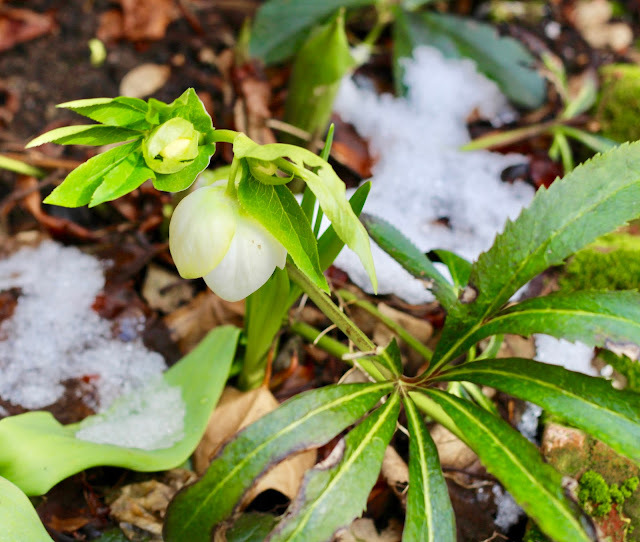 One of my hearty Hellebore, with mayonnaise white flowers peaking out of the melting snow -- tempting us into thinking spring is here! 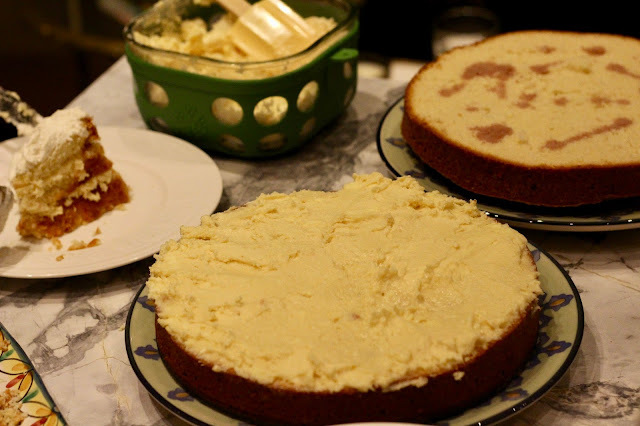 I have been searching high and low for a dense, but moist cake recipe, the kind that I remember from my childhood and was popular in the 1970s (I was just a baby, of course!). Back then, I think most home bakers used and referenced the Betty Crocker cookbook. I fondly remember the cakes being a slightly different texture, thicker but still moist, probably because they relied on unhealthy ingredients such as Crisco shortening. Or, maybe today's flour is a bit less dense. Or, maybe even, the standing mixer (ours was avocado green, below) didn't over mix? Whatever the case, I have been trying to replicate, somewhat unsuccessfully, that seemingly long-gone, tender, yet dense, cake consistency. It seems good cake, homemade or otherwise, is very hard to come by. My childhood mixer. 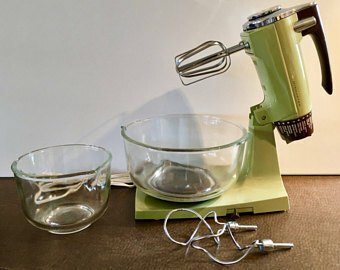 I don't think it was as easy to over mix the batter back then with less powerful mixers like this one. 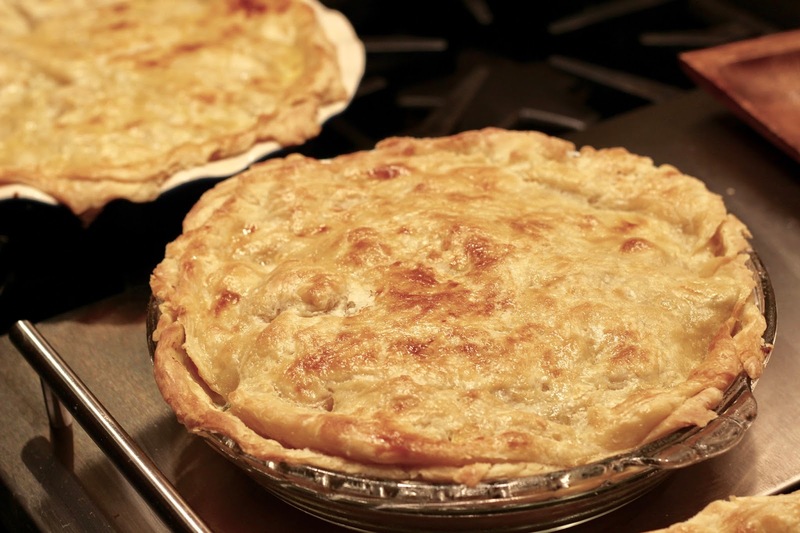 So, for this week's nor-easter, we set out to re-enact my childhood favorite dessert! In the absence of the Betty Crocker cookbook, I turned to next best alternative -- The Dessert Bible. 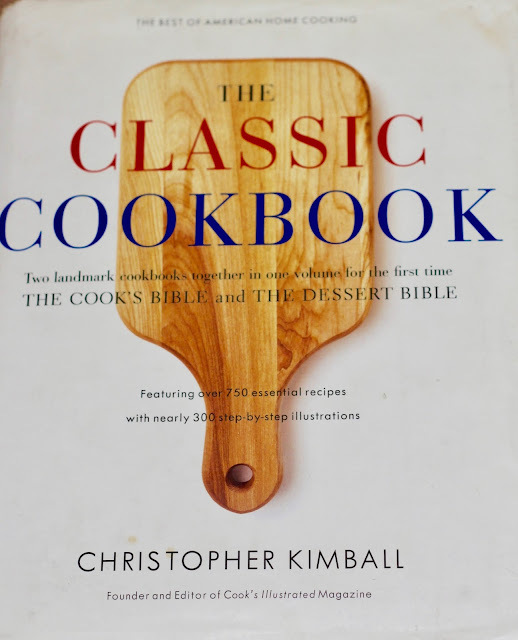 I highly recommend this cookbook and it's preceeding volume -- The Cook's Bible. Taken from the pages of the amazing Cook's Illustrated magazine, where classic dishes are meticulously tested, and retested, and the lucid outcomes are presented, these cookbooks answer the how and the why of perfected food and dessert. 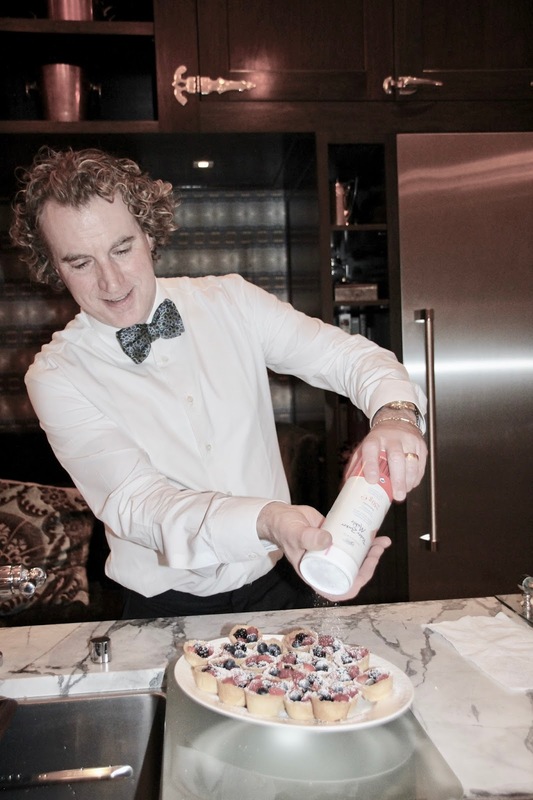 It's a little like science class in the kitchen and it's fabulous! From the Dessert Bible, I chose the well-rounded English pound cake. 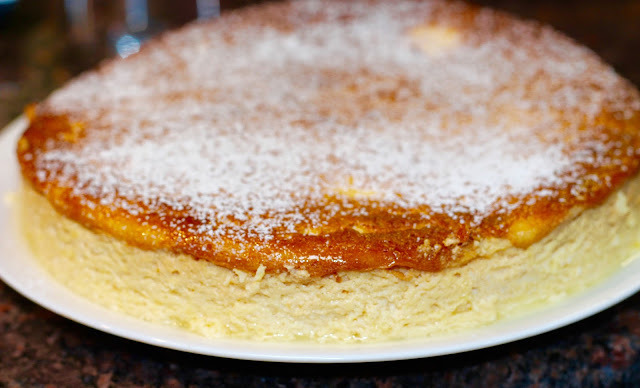 Pound cake is named, not for its weight, but for its use of 1 pound each of flour, sugar, butter and eggs. But, for this week's cake, I chose a slightly more American version, the 1-2-3-4 cake, which is made from 1 cup butter, 2 cups sugar, 3 cups flour and 4 eggs. When mixing batters, it's vital that the ingredients are room temperature so that they whip up properly, otherwise the cake will be too dense. Butter should be slightly above room temperature. Butter that is too soft will not whip up well either. For our cake, I neglected to take the eggs from the refrigerator early enough, so I warmed them in some warm water to get the temperature up. It worked. The best part of the cake was the buttercream icing. Most buttercreams are thick, and while ours was definitely not light, it was a touch lighter than most, and perfect for this cake as we only used it in the center. 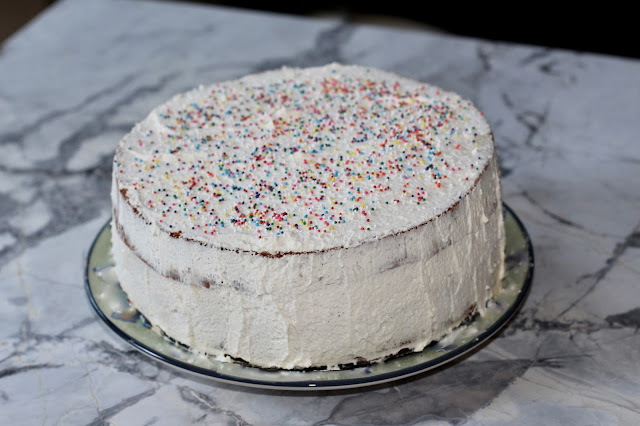 The outside of the cake was iced in a simple home-made whipped cream. If you are looking for an excellent buttercream recipe, I again recommend the Dessert Bible. Be sure to have a candy thermometer, though, as it is a little tricky bringing the egg-sugar mixture to 160 degrees. Frosting the cake. While the kitchen doesn't look too bad in this photo, in actuality, it was a bloody mess! The only problem with baking, aside from the need to be fairly precise, is that it is messy. The counters and sink become filled with batter dripping spoons, egg sodden measuring cups, and buttered spatulas. It can be sloppy, really sloppy. For me, the worst is the flour dust that settles on everything in the kitchen after pouring it into the mixer. Baking with children exaggerates this many fold. 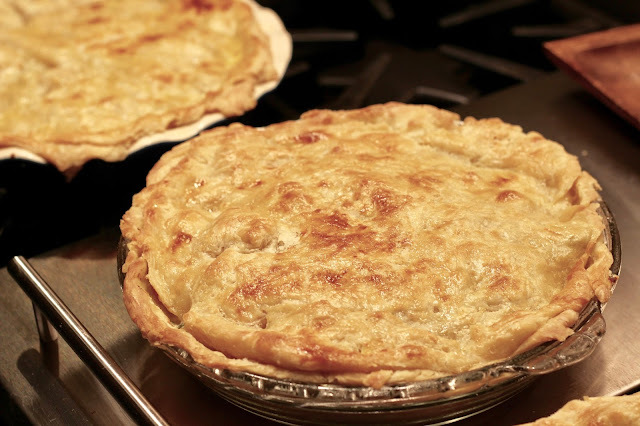 So, perhaps the best tool you can come into kitchen with when baking is patience. Be prepared for a mess and be ready to spend time cleaning. And this is why setting out to bake on a snow day is the perfect activity. What else is there to do? The homemade chicken pot pie that we ate before having cake. It was an rich, snowy night, filled with indulgent food!